Shouldn't the government make RAW and IB accountable by divesting their current reporting structure from the prime minister to a committee of MPs with impeccable public record? The R&AW, which is a wing of the Cabinet Secretariat, reports to the Prime Minister and its chief known as Secretary (R) has the right of privileged access to the prime minister. The Intelligence Bureau, which is a wing of the Ministry of Home Affairs, reports to the Home Minister, but its chief too, known as the Director, IB, has the same right of privileged access to the prime minister as Secretary (R). We should not change the present channels of command. However, India is one of the very few democratic countries, where there is no independent monitoring of the working and performance of the intelligence agencies by Parliament. Independent monitoring by a parliamentary oversights committee will improve efficiency and performance and prevent misuse of the agencies by the Executive for partisan political purposes. Since 1989, the question of having an independent parliamentary oversights committee has been under consideration from time to time on the pattern of the oversight committees in the US and the UK. The idea has remained a non-starter not because of any opposition from the agencies, but because of the reluctance of all political parties to dilute their control over the agencies by sharing the responsibility of the Executive with Parliament. It is important for the public to exercise pressure on the government to implement this idea at least now. Q: Instead of requesting Pakistan to hand over Dawood and Maulana Masood Azhar etc., shouldn't Indian agencies work to get such people eliminated through special operations? As I had stated in reply to earlier questions, we must revive our covert action capability to target terrorist organisations and their leaders and operatives indulging in acts of terrorism against Indian nationals and property from Pakistani territory. An efficient covert action capability would help us in disrupting the activities of these elements from Pakistani territory. The operations of such a division would be similar to the covert actions of the US intelligence against wanted Al Qaeda operatives operating from the Pashtun tribal belt of Pakistan. The US has been relying almost totally on covert actions from the air through unmanned Predator aircraft equipped with air-to-surface Hellfire missiles. They are able to use them in the tribal belt which is sparsely populated. The problem for India would arise from the fact that the anti-India, Pakistani jihadi organizations, operate from populated areas. Dawood Ibrahim operates from Karachi, Maulana Masood Azhar, the Amir of the Jaish-e-Mohammad, from Bahawalpur and Hafiz Mohammad Sayeed, the Amir of the Jamaat-ud-Dawa, from Muridke near Lahore. However, their training camps are in less populated areas. We must, therefore, develop a mix of land-based and air-based capabilities. 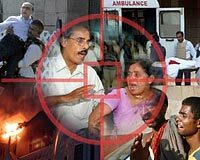 It is hoped that after the Mumbai attack, the government would have already decided to revive our covert action capability. Q: Isn't the present state of India direct result of the acts of commission and omission of not only the politicians but also those who run the government with a lot of authority but no responsibility whatsoever? All national security failures are due to the sins of omission and commission of the political leadership or the professional bureaucracy or both. Unless we have a high-powered enquiry by a national commission into the Mumbai terrorist attack, we will never know why we failed to anticipate and prevent the attack and why the handling of the attack after it occurred was unsatisfactory in some respects. Without such enquiries, we cannot identify our systemic and individual deficiencies and remove them. Unfortunately, we have a cover-up culture in India and we avoid such detailed enquiries in public. It is said that secret internal enquiries are held, but one does not know how thorough are those enquiries and what follow-up action is taken. After the assassination of Indira Gandhi, a detailed enquiry was held in public and its report was released to the public. Some senior officers, including the then chief of the IB, had to quit because of their failure to protect her. Detailed public enquiries were also held after the assassination of Rajiv Gandhi and the Kargil conflict. The reports, in edited forms, were released to the public, but no action was taken against any senior officer. While the Rajiv Gandhi assassination report was at least discussed in the Parliament, the Kargil report was not even discussed. We must get out of this cover-up culture if things are to improve. Q: How should we react on Pakistan's decision for sending the troops at border? This is a matter which should be left to the Prime Minister to decide on the basis of professional advice from the chiefs of the Armed Forces, the intelligence agencies and the Mnistries of External Affairs and Defence in consultation with other members of the National Security Council and the Cabinet Committee on Security.